In a large mixing bowl, using a mixer on medium speed, beat together butter and sugar until creamy - about 1 minute. Beat in egg, cocoa powder, chocolate, corn syrup, vanilla, baking soda and salt until well combined. Beat in graham cracker crumbs and flour until just combined. Chill dough in freezer for 30 minutes. Drop rounded spoonfuls of dough onto cookie sheets. Bake 12 minutes or until well risen, and set. Cool 2 minutes. 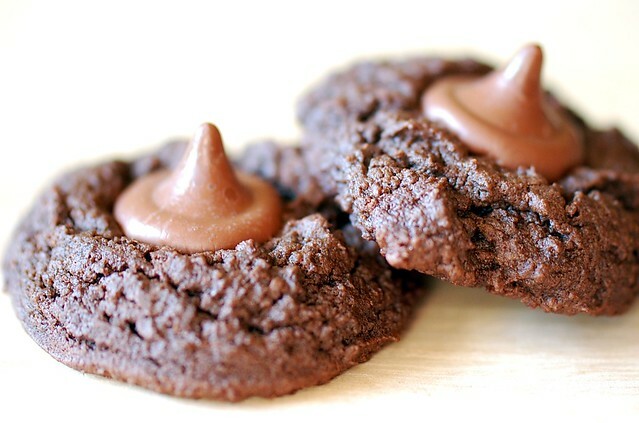 Press a chocolate into the center of each cookie. Transfer cookies to wire racks to cool completely. 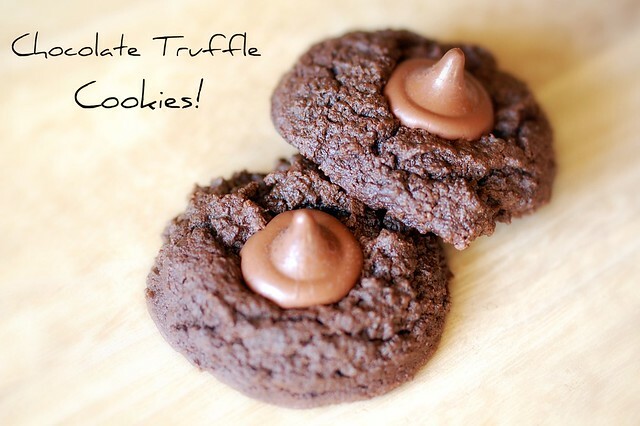 25 comments on "Chocolate Truffle Cookies"
You know how much I love chocolate. These are my dream cookies, I will definitely try making these! Your recipes are always so interesting and creative, they're fantastic! I'm always inspired to try everything you make. I have been wanting to get some chocolate graham crackers, I'll have to try these. Triple chocolate cookies? Yes please. I don't know anything about this coofeehouse, but these cookies looks really darn good! You always put such interesting ingredients into your cookies. I wonder how cinnamon graham crackers would give a different flavor to these. I'm not a coffee drinker, but that coffee drink does sound good - and highly caloric! Just as well I avoid coffee shops. For me the best way to drink coffee is with lots of fattening stuff in it! Now these look like a must make type of cookie, graham crackers and chocolate, how could you possibly go wrong? Thanks for the recipe! Interesting - that addition of chocolate graham cracker crumbs. I bet these would be good even without the kisses on top. OR you could use almond m&m's in Christmas colors maybe...or even plain m&m's. i love sniffing coffee too! I don't really like drinking it, but I could inhale the smell of coffee beans forever. These cookies look tasty. 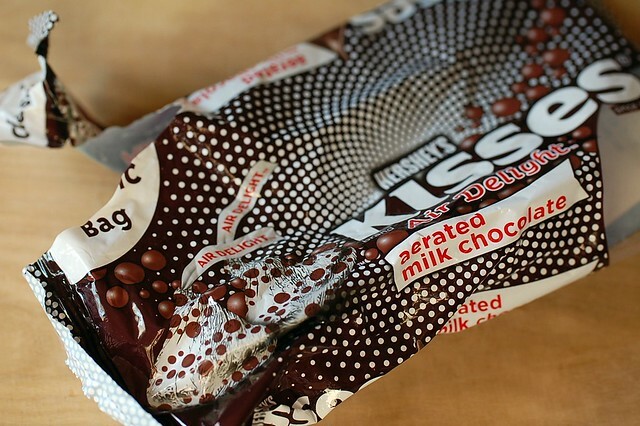 I've been wanting to try those new kisses...if they're anything like Aero chocolate bars from england, I bet they're pretty tasty. These look amazing, I'll be baking a batch this weekend! This sounds like triple chocolate trouble.... delicious - mouth watering trouble. The addition of the chocolate Graham crackers .... genius!! 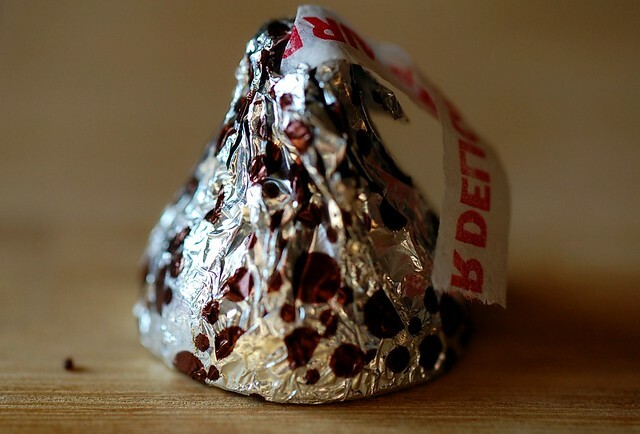 Where do you find aerated kisses? I've never even heard of them! I love cookies <3 I have a feeling these would be FANTASTIC. I still can't believe you're surviving without coffee. Don't worry...I'm working on drinking your share. Oh these look good! I can't go a morning without my coffee, we are joined at the hip! You are right - these would be great at a cookie exchange! Wowza do these look good. I need chocolate! Wow, these cookies look delicious. I love coffee and will be sure to check out these beans. Thanks for the recommendation! i hadn't seen those aerated kisses--interesting. what'll they come up with next? nice recipe! KJ, wow, thank you so much! That's kind of you to say. Whoops, published that comment too quickly. Rachel, I bet cinnamon grahams would be great, too. Sue, I agree. They'd be good with Rocher chocolates in them. Mmm. Anon, I found them at Walmart. They have them in grocery stores, too. Those kisses sound good! They remind me of the Milka Luflee chocolate bars you can get in Europe. Yum...I love cookie exchanges. And these look awesome.